Small business owners in the modern world can make things happen for themselves and their businesses that never would have been within reach of their predecessors. Today, there is virtually nothing that a small business owner can’t do for themselves. But, just because you can DIY a component of your business doesn’t always mean you should. There are times when the expertise of others will be a priceless investment. It can be tempting to believe that your passion for the business should count more than skills or experience in specific areas, but sometimes your care for the company means you will need to outsource. In many instances, technology has managed to replace accounting and finance professionals. Today, apps and programs have been developed that can manage fairly specialized work for a small business owner. That blending of spheres is what is granting newfound agency to professionals who want to do it themselves. In many ways this comes down to how complicated your finances are. If you’re only dealing with a small number of straightforward transactions, an app may be the right choice, but as your business grows, the complications will too. When you do decide to hire a pro, you also have to decide what that looks like. There are multiple levels within the accounting profession to consider. 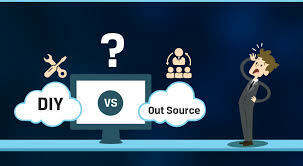 Do you outsource? Or hire full-time employees? If you need someone full-time, do you need more than a one-person team to get through the work load? All of the technology that has granted agency to individuals wanting to own their own business has also opened them up to security threats. Data breaches are so widespread that some claim the question is not if but when. Approximately half of small businesses will experience a data breach, and of those half will fail within the following six-month period. In terms of your business’s success, this could be a matter of life and death. So make sure each component of your business is arranged with cybersecurity in mind. Educate Employees: Educate your employees so that they understand the risks and the appropriate measures to be taken in their specific roles. They should understand best practices for passwords and authentication processes. When there is new information or education, they should have it. Update Devices: All devices including computers, tablets, and phones should be kept up to date. Hackers often exploit security holes in outdated operating systems. Limit Access: Limit access to your business's information, devices, and Wi-Fi network. Regardless of the perceived trustworthiness of an individual requesting access, if they don’t absolutely need it, they shouldn’t have it. Keep Backups: A good rule of thumb is that you should have two copies of everything. Use a cloud-based platform so that if information is taken or destroyed from a device, you still have access to it. Cybersecurity is a big deal, but so is the physical safety of your business if you have a brick-and-mortar location. Not only does protecting the premises also mean you’re protecting the bottom line, it also means you’re ensuring that employees and customers alike will feel comfortable at your place of business. Controlling who can access specific physical spaces. Photo ID cards for employees. Identification for visitors and contractors when they’re onsite. Secure networks so that those on premises can’t take advantage of them. A security culture among employees. Much of what Bennett says is targeted at large businesses. However, the same ideals should be implemented, even if you’re operating within a fairly small space. You should know who everyone is, why they’re there, and where they are at all times. You should also educate yourself and your employees on the finer points of unlawful entry and trespassing so that everyone knows what the protocol is in the unfortunate event that that information becomes relevant. Those who wish to DIY their marketing efforts have benefitted endlessly from the digital transformation. It has provided massive amounts of free data in the form of social media as well as many cost-effective platforms to utilize. If you and your team can manage these key areas, that’s when you know you’re in a prime spot to DIY your marketing strategy instead of outsourcing. Mobile: Over half of consumers have made purchases with their mobile device in the last six months. Even more striking, 80 percent use their mobile devices to find reviews, compare products, and find stores. If you aren’t optimizing your website for mobile, you’re definitely missing connections with a large chunk of your customer base. SEO: Hardly anyone looks past the first page of search engine results, are you taking the necessary steps to make sure you’re seen by your target audience in those search results? Visuals & Video: Even if your product is the very best in the industry, it’s not going to have near the impact it should if your content is visually unappealing. Can your in-house efforts communicate the ideals behind your company’s brand successfully through the images and video you’re producing? Influencer Marketing: Peer reviews can make a world of difference. Influencer marketing takes that concept to the next level. Individuals who are well-known and are respected are going to drive sales; they’re going to influence how your target audience perceives your product. If you can make these key marketing tenants happen, then your marketing efforts are likely poised for success. However, if these are beyond the realm of what your company can knowledgeably achieve, you know then that it may not be the best place for your DIY efforts. Ultimately, the thing that every small business owner has in common is that they’re go-getters. They’re willing to work hard, think creatively and critically, and pursue their passions. Those qualities combined with the resources that are now available to them, mean that for many they’re going to be able to accomplish nearly every part of the business in-house. However for others, even those who do have the ability, the reality is that it will take away from the time you can devote to focusing on the business' bread and butter. It’s a matter of considering the skills available, the budget, and the time that can be reasonably devoted to each aspect of the business.